Do your arches ache or your heels hurt? Got gout or battling bursitis? If so, you are among the three out of four Americans who will suffer some kind of foot ailment in their lifetime. 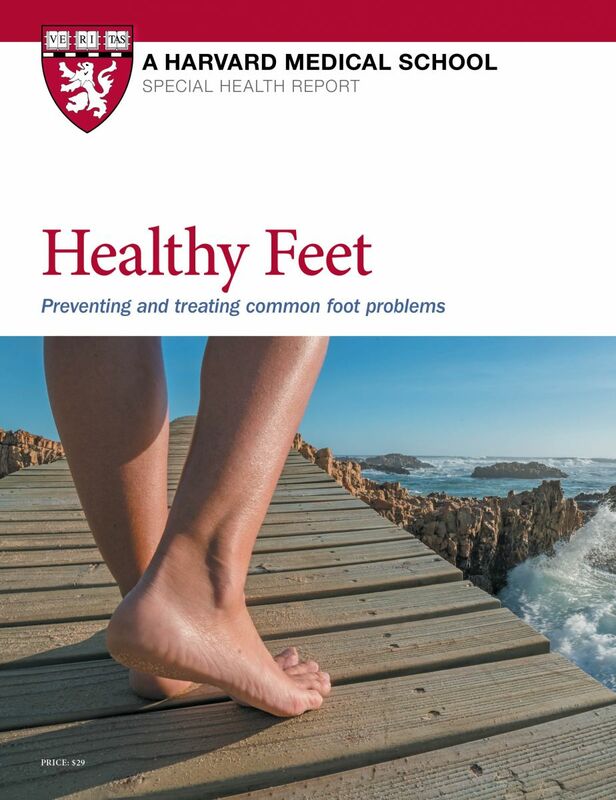 This Special Health Report, Healthy Feet: Preventing and treating common foot problems, covers the most common foot problems and helps you prevent and treat them. Give your feet the care they need. Healthy Feet, from Harvard Medical School, will help you keep your feet looking younger, feeling stronger, and pain-free. You’ll learn how to address plantar fasciitis, the leading cause of heal pain, without surgery. You'll gain the know-how to properly treat a sprain, to determine if you've broken a bone, to halt toenail fungus, and to effectively soothe pain of osteoarthritis in the feet. The report is also packed with practical steps to keep your feet strong, supple, and problem-free. You’ll be alerted to the mistakes people often make when buying shoes, walking, or even clipping nails. Plus, you’ll be briefed on the latest advances in minimally invasive surgery, pain relieving medications, and more. Discover how you can prevent and treat those conditions that can make walking painful and how you can achieve and maintain the “foot fitness” that will help you stay mobile, active, and engaged. Take a step in the right direction and order your copy of Healthy Feet today! If you’ve got gout, you feel it. Gout is a painful inflammation of the joints that is becoming more common. Gout causes arthritic symptoms when uric acid, a normal byproduct of digestion, accumulates in the joints. A person with gout either makes too much uric acid or cannot excrete it properly. As a result, the uric acid forms crystals that settle in the joints and cause inflammation, sudden jabs of pain, soreness, redness, and swelling. In the foot, gout most often affects the joint at the base of the big toe. Although everyone makes uric acid naturally, levels of this compound can increase when you eat certain foods that contain substances known as purines, such as organ meats, sardines, and some shellfish. Purines increase production of lactate, which competes with uric acid for excretion. Gout affects men more frequently than women, probably because men have higher uric acid levels than women. That changes at menopause, however, which explains why men tend to develop gout between ages 30 and 50, while women are more likely to develop it after age 50. To treat an attack of gout, your doctor will usually begin by prescribing an NSAID. Avoid aspirin, as it may raise uric acid levels. If you cannot tolerate NSAIDs or if they do not help, your doctor may suggest a corticosteroid, such as prednisone, to reduce inflammation. Corticosteroids may be taken orally; less frequently, they are injected directly into the affected joint (usually numbed ahead of time with a nerve block). Another option is an injection of adrenocorticotrophic hormone, a compound that directs your adrenal gland to make more cortisone. Although the medication colchicine may be given in pill form, it tends to cause unpleasant side effects (nausea, vomiting, cramps, and diarrhea). To reduce uric acid levels over the long term, some physicians prescribe allopurinol (Zyloprim). More recently, the FDA approved febuxostat (Uloric). The most common side effects of these medications is rash. If a rash appears, discontinue the medication and talk with your doctor. Other side effects include nausea, joint pain and liver function abnormalities. Your doctor is also likely to recommend making dietary changes, such as drinking more water and eating fewer foods that contain high amounts of purines, such as beef, goose, liver, sweetbreads, mussels, anchovies, and herring. Even poultry, seafood, and some vegetables—including spinach, asparagus, beans, lentils, mushrooms, and dried peas—contain purines. Lowering your alcohol consumption should also help reduce uric acid levels and relieve your symptoms.